When most people are in deep slumber in their beds, Mandy Kloepfer is stirring well before the sun’s up, getting ready for a 3 a.m. ride indoors on her training bike twice a week. 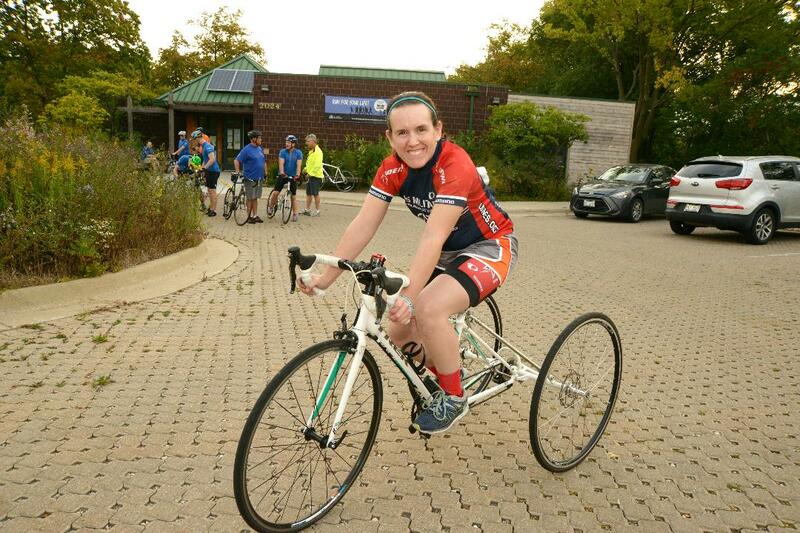 The 2015 co-chair of the OTR Challenge Tour and a former resident of OTR’s Harrison Square Apartments in Rockford, Mandy who is 30, now lives across the street in her own condo and devotes many hours each week to the sport of paracycling. In May of 2017, Mandy’s drive and skill led her to the incredible experience of competing internationally in the UCIParacycling World Cup in Maniago, Italy. Among her favorite parts of that trip was “getting to experience different cultures and countries. “ The month prior, she competed in the U.S. Paracycling National Championships in Grand Junction, Colorado, and is scheduled for more races later this summer. A former National Guardsman, Mandy moved into Harrison Square following a major car accident when she was 20 years old that caused traumatic brain injury and significantly impacted her mobility and speech. Along with months of intense physical therapy, the move from her parents’ home to her own apartment at Harrison was a fundamental part of her transition to life before and after the accident. “Living at Harrison Square gave me an opportunity to live on my own. I was surrounded by neighbors who were caring and helpful,” Mandy reflects. All of us at OTR are enormously proud of Mandy and her unstoppable spirit, which is truly an inspiration. As some of her biggest fans, we will continue to cheer her on in all of her future endeavors. At the rate she’s going, we’re ready to applaud from the sidelines vigorously and often!